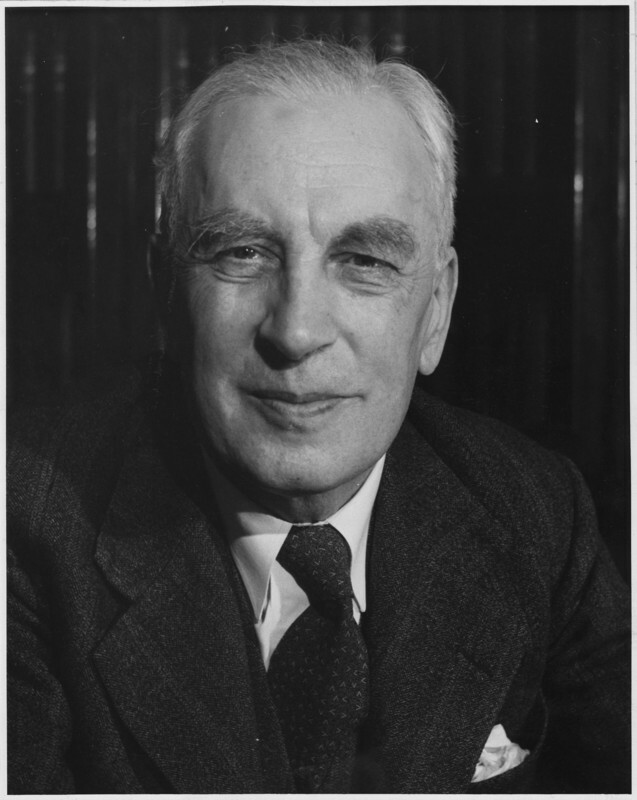 Arnold Joseph Toynbee was an influential British historian, widely read and discussed in the 1940s and 1950s due to his prodigious output of books, papers, articles, speeches, and presentations, especially his twelve-volume A Study of History. He also had an important role in the early documentation and characterization of the Armenian Genocide. Toynbee was born in London, the descendant of a family with generations of intellectuals. His sister Jocelyn was an archaeologist and art historian. He won scholarships to Winchester College and Balliol College in Oxford (1907-1911), and studied briefly at the British School at Athens. He became a tutor and fellow in ancient history at Balliol College in 1912. A year later, he would marry Rosalind Murray, daughter of historian Gilbert Murray. They would have three children. In 1915 he began working for the Political Intelligence Department of the British Foreign Office. From 1915-1917 he would write nine books, mostly about German and Turkish atrocities, the first of them being his survey of the Armenian Genocide, Armenian Atrocities: The Murder of a Nation (1915), based on much of the documentation collected in The Treatment of the Armenians in the Ottoman Empire (1916), which he co-edited with Viscount James Bryce. The information provided by credible eyewitness accounts of Armenian persecutions, arrests, murders and deportations withstood modern historical scrutiny, despite futile attempts by the Young Turks and their German allies—followed by contemporary denialist writers—to dismiss it as wartime propaganda. Toynbee served as a delegate to the Paris Peace Conference in 1919. His support for Greece and hostility to the Ottoman Empire during the war earned him an appointment to the Koraes Chair of Modern Greek and Byzantine Studies at King’s College. He became the correspondent for the Manchester Guardian during the Greco-Turkish War of 1921-1922, which resulted in the publication of The Western Question in Greece and Turkey. His change of heart, accusing the Greek military government of massacres and atrocities in temporarily occupied Turkish territory, was followed by enmity from wealthy Greeks who had endowed his chair, and he was forced to resign in 1924. Toynbee became research professor of international history at the London School of Economics (1925-1956) and director of studies (1925-1939) and director of foreign research (1939-1943) at the Royal Institute of International Affairs, which conducted research for the British Foreign Office. During World War II, he served as director of the research department of the Foreign Office (1943-1946). In 1946 he divorced his wife and married his long-time research assistant, Veronica Boulter. After 1960, Toynbee's ideas faded both in academia and the media, to the point of seldom being cited today. However, his work continued to be referenced by classical historians. He continued producing books and memoirs in the 1960s and 1970s. In 1972 he published, in collaboration, a new one-volume abridgement of the entire Study of History. Meanwhile, after four decades of silence, he spoke in his two memoirs, Acquaintances (1967) and Experiences (1969), of his views regarding Turks and Turkey, but he also became one of the first worldwide known historians to unambiguously characterize the Armenian annihilation that he had documented fifty years before as genocide. He repeated his qualification in his posthumously published Mankind and Mother Earth: A Narrative History of the World (1976). Toynbee had written in The Treatment of the Armenians in the Ottoman Empire (1916): “In one way or another, the Central Government enforced and controlled the execution of the scheme, as it alone had originated the conception of it; and the Young Turkish Ministers and their associates at Constantinople are directly and personally responsible, from beginning to end, for the gigantic crime that devastated the Near East in 1915.” In Acquaintances (1967), he underscored: ''They therefore decided to deport the Armenians from the war-zone, and this, in itself, might pass for a legitimate security measure. In similar circumstances, other governments have taken similar action. ... In Turkey, however, in 1915, the Ottoman Armenian deportees were not only robbed; the deportations were deliberately conducted with a brutality that was calculated to take the maximum of lives en route. The British historian passed away on October 22, 1975, at the age of 86.